The Asset Tracking Benchmarking Association is dedicated to the analysis and improvement of business processes in the area of Asset Tracking. Through the exchange of data gathered in benchmarking surveys, members will be able to benefit from the experience of many companies. Membership is open to individuals employed as permanent employees of companies in the area of asset tracking. Use this form to request a free copy of our "Top 10 Avoidable Benchmarking Mistakes White Paper" or request further information about our services. Send me the free eBenchmarking Newsletter. 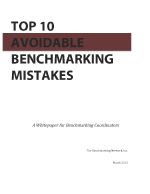 Please send my free copy of the "Top 10 Benchmarking Mistakes White Paper" to the email provided.